Abstract: In the coming decades population growth will particularly take place in the emerging and least developed countries. This implies that these countries will be confronted with the need to increase their food supply by a larger production in their own territory, may be in combination with increased imports. Having in mind the required increase in food production in combination with the need for sustainable rural development a wide range of issues is of importance. From the point of view of food production there is a common feeling that 90 % of the required increase will have to be realized on existing cultivated land and 10 % on newly reclaimed land. From the point of view of sustainable rural development, socio economic and environmental aspects play crucial roles (Schultz et al, 2005). In this paper, the focus is on irrigation of agricultural land in Montenegro.About 18% of arable land is irrigated in the world and about 40% of total food is produced on these areas, while about 13% of agricultural land is irrigated in Europe, 1.05 ³% in Montenegro. The most common type of irrigation in Montenegro is with "artificial rain", while the remaining quantities of water are affected by watercourses, submersible water, lakes, reservoirs and from the water supply network. Investing in the revitalization and construction of irrigation systems in Montenegro should focus on projects that will demonstrate the justification of investments and achieve a quick return on invested funds, which will contribute to raising the motivation, interest and spreading of irrigation in larger agricultural areas. Activities and measures must be in function of real needs that will be based on the demands of agricultural producers. Abstract: In real, the vortices created behind the wind turbine and around the blades due to the induction flow created by the difference in pressure in rotation plan and the rotational the blade moves, which summarized in Glauert’s model as the axial and tangential induction factors. In this work, a Matlab code has been established to analyze the induction effect on the performance of wind turbine. This code based on the enhanced blade element momentum theory with considering the recent correction. The results demonstrate that the axial induction effect is the master responsible for increasing the mechanical stress effect that decreases the wind turbine performance at the low wind speed value. In another side the increasing of wind speed accompanied by the increasing of tangential induction effect at tip and root of blades with creating vortices, which put the rotor in the critical case with less efficiency. Abstract: Marahoué region in western of Cote d’Ivoire is a high agricultural area under frequent climatic disturbances mainly due to high rainfall variability. The aim of this study is to assess the effects of drought on water resources, in order to propose mitigation or adaptation strategies to the people. To do this, an analysis of rainfall data was done by computing standardized precipitation indices (SPI) at different time scales: 3 months, 6 months, 12 months and 24 months in Zuenoula (1972-2000), Bouaflé (1940-2001), and Sinfra (1966-2000). These short-term indices (03 months and 06 months) indicate that the study area observed a moderate drought on 24.14% to 42.86% of the total time analyzed. To means term (12 months), 24.14% to 37.14% of the time analyzed recorded a moderate drought. In the long term (24 months) the SPI values indicate that 31.67% to 42.42% of the total time analyzed recorded a moderate drought; 6.06% to 11.67% of the total time analyzed is marked by severe drought. Abstract: The Béni Haroun dam, located on Oued Kébir Rhumel, is a very important dam in the region of Mila, and in all the eastern region of Algeria, by the volume of water that it is able to store (about one billion of m3), and also by its situation that allows it to ensure the need for drinking water supply (DWS) and irrigation (IWS) water of five wilayas bordering. After being commissioned in 2003, there is some variation in the climate. 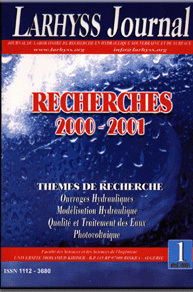 This paper is an approach to the evaluation of the climatic consequences of the reservoir of the Beni Haroun dam (Mila), mainly on the precipitation and the temperature, by the comparative study, of these parameters, between the periods before and after the commissioning, in the five closest surrounding stations (Beni Haroun, Hamala, El-Kheneg, Ain Tinn and Mechtat Serradj), this approach has shown that on an annual scale precipitation has increased, for stations closest to the dam, and a lowering of the annual values of temperatures, in all the stations examined. Abstract: The study described in this paper has consisted of simulating the real future behaviour of the Ouémé river basin's water flow by 2040. The approach of the Rural Engineering model, with two variables, at a monthly time step named GR2M has been adopted owing to its robustness. This model is an indispensable tool for studying the evolution of water resources in the medium and long term. For our approach, the projected data, from 2016 to 2040, were generated using the Auto-Regressive Integrated Moving Average model. Observed data were then used for the calibration and the validation of the GR2M model. The results obtained showed that the GR2M model is a very satisfactory tool for simulating the transformation of rainfall data into flows on the one hand and an impact of future climate change resulting in a decrease in annual average flows between 11.90% and 46.37% by 2040 on the other hand. The quality parameters revealed very interesting values obtained from the model on the three representative sites of the Ouémé basin with Nash-Sutcliffe more than 70% and determination coefficient more than 0.75. Abstract: Inter-annual fluctuations in rainfall over the last three decades have been associated with the recurrent floods in Ouémé estuary. The purpose of this work is to analyze the water and sediment flows and their conditions for remobilization of sedimentary deposits during floods. In September 2016, the characteristics of the water were measured with multipara meter and turbid meter, liquid flow rates with the aDcp current meter. Suspended sediment (MES) and bottom sediment were collected for particle size analysis. Water sampling was resumed in March 2017 and the MES of all waters was analyzed by spectrophotometer. The water flow in September was 617 m3/s in Bonou and 572 m3/s in Adjohoun. MES, turbidity, and shear rate are higher in September, more importantly in Adjohoun than Bonou. The aforementioned flows were sufficient to remobilize sediments having a median d50 less than 0.1 mm. This remobilization is indicated by an increase in sediment flows from 46.3 Kg/s in Bonou to 55.6 Kg/s in Adjohoun. Abstract: The characterization of the tannery wastewater by analysis of a certain number of physico-chemical parameters has shown an important organic pollutant load, particularly expressed by chemical and biological oxygen demand (5280 mg/L for COD and 1300 mg/L for BOD).The aim of this work is to remove of COD from tannery wastewater by using one of the most efficient advanced wastewater treatment, the Fenton reaction. The parameters influencing the COD removal, namely hydrogen peroxide concentration, ferrous ions concentration and pH have been studied. The effectiveness of this process, defined as a reduction of COD was 87% using a concentration of 2x10-3 mol/L of Fe+2 and 10-2 mol/L of H2O2. The optimal pH is 3.5.So, it has been proved that the Fenton process can be a feasible technique for the treatment of tannery wastewater as a preliminary stage preceding its further biological treatment. Abstract: In the context of sustainable development and the recent climate warming in the semi-arid region of Djelfa whose vegetal production of pastors depends solely on rainfall, analyses of the rainfall data for the last 42 years were mandatory basing on the coefficient of variation CV, the precipitation concentration index PCI, simple linear regression, Mann Kendall test, Sen’s slope and finally the homogeneity tests. As results, a drastic variability was recorded for all the monthly and annual rainfall from year to another with no seasonality; namely a strong hydric stress would threaten plants subsistence and cause summer flood that destroys soil. Moreover, an annual decreasing was due to almost of months decreases particularly winter and spring. However, August, September and October recorded slight increases to let expect an eventual autumnal advance in August instead of September. This goes along with trend results whose the maximal decreasing trend was in November,then January. However, the increasing trend was the most in August, and July had also an increasing trend. In fact, the significant decreases were due in part to the abrupt decreases almost in winter then spring. Under the desertification threat, this drought and the drastic hydric stress make a real challenge to development. Abstract: The objective of this study is to examine the reactivity of the humic type organic material in the presence of chlorine as sodium hypochlorite. Humic substances are dissolved in water from different origins (distilled water, drilling Sidi Khellil and Ain Dalia Dam). The effect of ammonia is especially considered in these reactions.The experimental tests focused on the determination of chlorine consumption potentials, the influence of the chlorination rate, as well as the influence of the initial ammonia concentration.The results obtained show that the reactivity of chlorine with respect to humic substances, in the presence of ammonia, is very important both in distilled and in mineralized waters and whatever changes in various parameters.For variable rates of introduced chlorine, a breakpoint characteristic curve is obtained, the latter being more pronounced in the case of distilled water and mineralized drilling water.The involvement of ammonium ions in the chlorination reaction, and more particularly the value of the chlorine / ammonia ratio, can influence both the nature and the quantity of by-products formed (chloramines and organohalogen compounds). Abstract: In a world where natural resources management including water resources becomes a problem, it is necessary to establish rational water management tools. In this perspective, hydrological modeling appears as a tool for better management of water resources especially in basins like the Marahoué where water requirements for various uses are increasingly growing. The aim of this study is to analyze the sensitivity of the hydrological model GR2M the rain-ETP inputs estimated by different approaches. To do this, after the comparative analysis of methods for estimating rain and ETP, the sensitivity of the model was evaluated using 9 combinations (3 ETP x 3 rain). The analysis of estimation methods of ETP shows that the approach to Blaney overestimates the values compared with those of Penman and Thornwaithe. As for the estimation of the average rainfall in the catchment area, the approaches used have almost identical variations. The best performance of the model calibration and validation are obtained with the torque data estimated by the inverse-Blaney approach. Abstract: In this study two explicit schemes of Lax-Friedrichs and MacCormack are used to simulate the dam break wave problem. In order to improve the results of numerical simulations, two interface dissipations (ID) are used to reduce the numerical oscillations. We performed a comparative study of these dissipations and their different locations in the numerical scheme. These comparisons allow us to choose the numerical method adapted to the simulation of the dam break wave. The results are presented in one dimension and verifications were made with the analytical and experimental solution of other authors. Good agreement was found between the simulated, analytical and experimental results regardless of the flow regime. This technique allows to simulate the dam failure wave without taking into account the flow regime and to keep the solution stable for the values of the Courant-Friedrichs-Lewy (CFL) number up to a value close to unit. Abstract: Agboville is a city in Cote d'Ivoire where floods are frequent. This study aims to identify their sources and thus to propose measures to reduce or control them.The database includes hydroclimatic data, satellite images, terrain photos and topometric surveys. The land use maps of the Agneby watershed showed the near disappearance of the dense forest in favor of the areas of degraded forests, crops and fallows.Despite the general decline in rainfall and runoff, extreme rainfall has become frequent, resulting in flooding of low and vulnerable areas.Hydrological modeling of the Agneby watershed has shown that the forest dynamics led to the reduction of the evapotranspired and infiltrated water slides on the one hand and the increase of the water flow. The importance of the water slide is the proof of the frequency of floods on the watershed.Topometric work has shown the vulnerability of the site to floods. The warning system based on fluctuating water levels in the beds and their spread beyond is a fairly effective and dynamic method for controlling floods. Abstract: The objective of the study is to improve the removal of refractory organic compounds during coagulation-flocculation in the presence of coagulant alone and then in combination with activated carbon powder. The Jar-Test was performed in the laboratory on aromatic organic compounds (salicylic acid, paracetamol) dissolved in distilled water. The purpose of the tests was to evaluate the removal efficiencies of organic compounds for variable doses of reagents and pH.The interactions of organic compounds in the presence of the coagulant combined with the activated carbon would be surface mechanisms (physical adsorption, ligand exchange or complexation on the surface of flocs of aluminum hydroxide or activated carbon). The results obtained indicate that activated carbon powder has a significant impact on the improvement of the elimination efficiencies of paracetamol and salicylic acid, especially at a pH close to neutrality. Abstract: The phenomenon of silting threatens hydrotechnical infrastructure Algerian, Thus 65 million m3 of silt are deposited annually in dams. To predict the decrease in useful capacity and the life of a dam, studying the spatio-temporal evolution of siltation in a dam becomes a priority. The present study will have access on the evolution of the siltation in the time and according to the depth of the water in the reservoir of Sidi Mhamed Ben Aouda dam. To achieve such a result, bathymetric survey data were retrieved from the National Dams Agency. According to initial results, siltation increased over time from the nineties following the degradation of the watershed. A volume of silt equal to 100 million m3 is currently at the bottom of the dam SMBA, a filling rate equal to 42%. A value that ranks it among the dams most threatened by siltation. The National Agency for Dams considering its short term desilting. A study on the valorization of silt allows its use in the field of construction and agriculture.